Lady Harberton is having some holidays on the beginning of May to explore Normandy by bicycle. Your orders on the website from Friday, the 26 th of April 2019 to sunday, the 12th of May 2019, will be processed after monday, the 13rd of May 2019. Thank you and see you soon ! 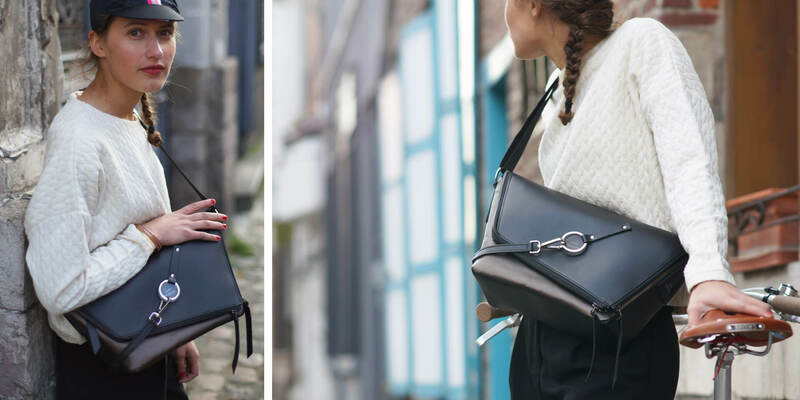 Lady Harberton’s Messenger bag is a new, elegant et beautiful design of the messenger bag that you carry on your back and on or over your shoulder. When you commute by bike, foot or with your scooter, you carry your bag in the back like a bike messenger. The bag remains stable thanks to the second strap so you keep your hands free. 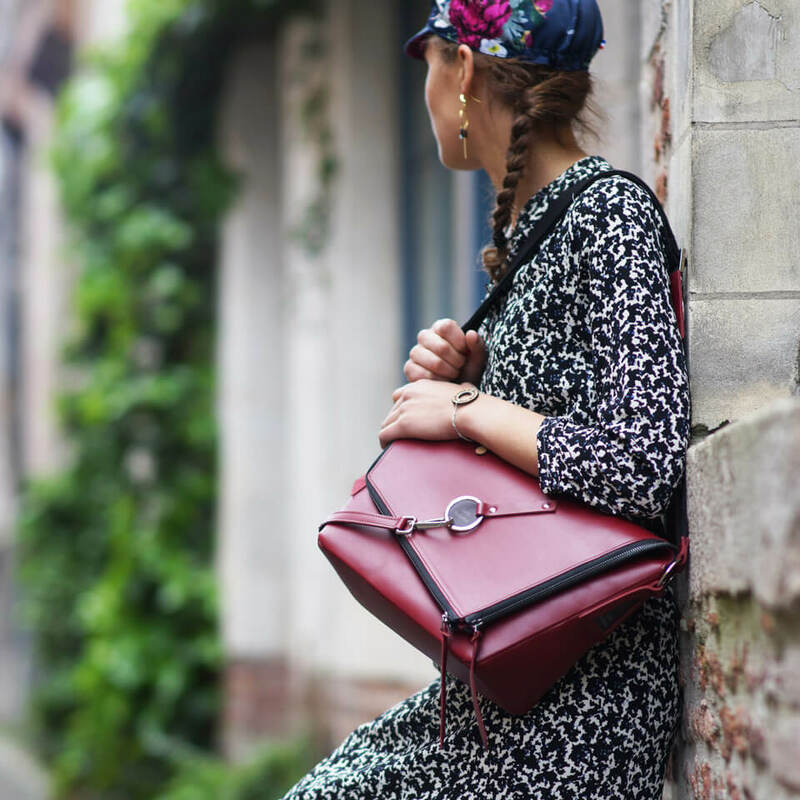 When you stroll in the streets, you carry the bag as a traditional lady handbag. …And to be stylish everyday ! 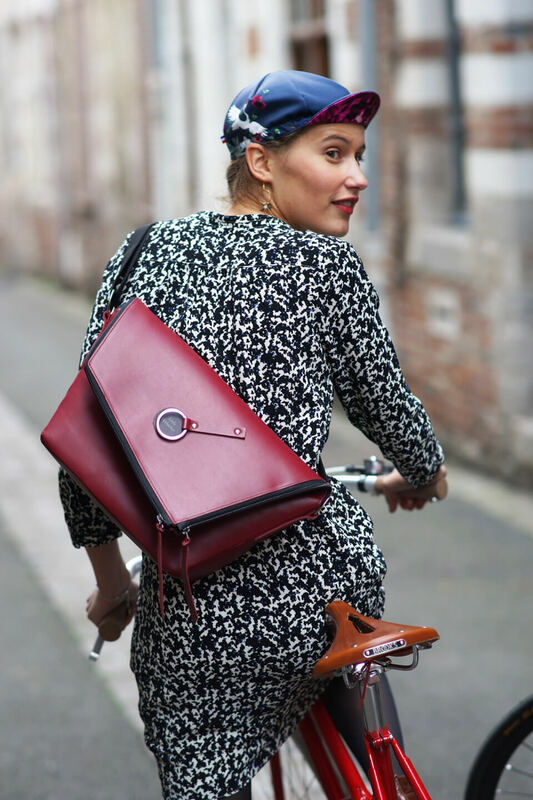 Lady Harberton’s messenger bag is useful as a bike messenger bag and a beautiful handcrafted lady leather bag with elegant and refine design. 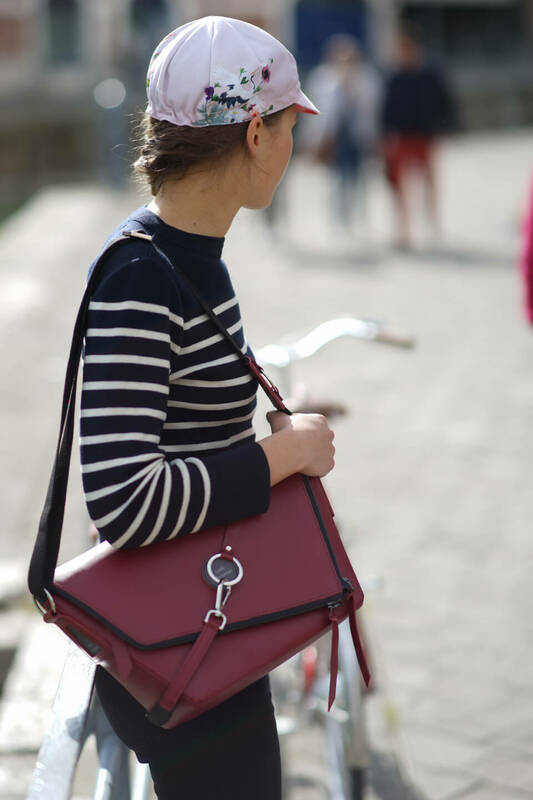 I created the messenger bag because as active and modern women, we deserve solutions that are both making our everyday life easier and making us elegant and stylish. Before when I was getting on my bike, I didn’t want to choose between my charmless but practical backpack and my elegant but complicated handbag. Inspired by the New York bike messengers, I’ve made around ten prototypes before finding the right design : The Messenger Bag. 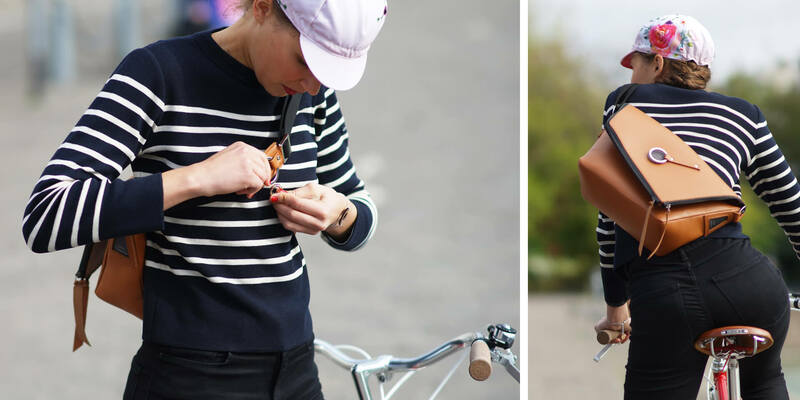 No more handbags falling from the shoulder ! 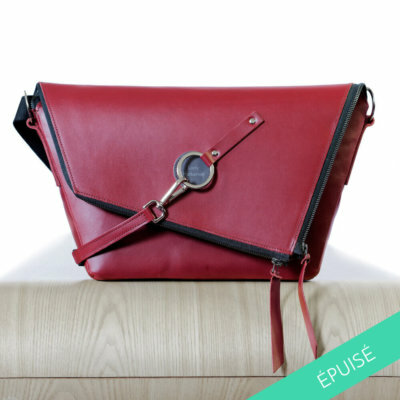 The Messenger Bag transforms in the blink of an eye ! 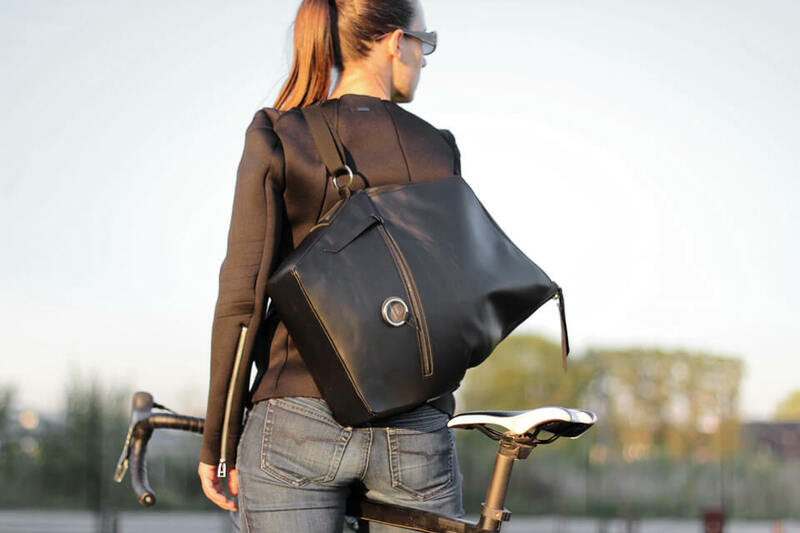 The messenger bag is equipped with a second strap with a hook and a ring on the main strap so you can place your bag on your back and keep it stable when cycling. Look at the video demonstration. On foot, the second strap is used to close the bag and secure your belongings. Your belongings are quickly accessible. Turn your satchel in front of you to catch whatever you need. Carry even your laptop with you ! 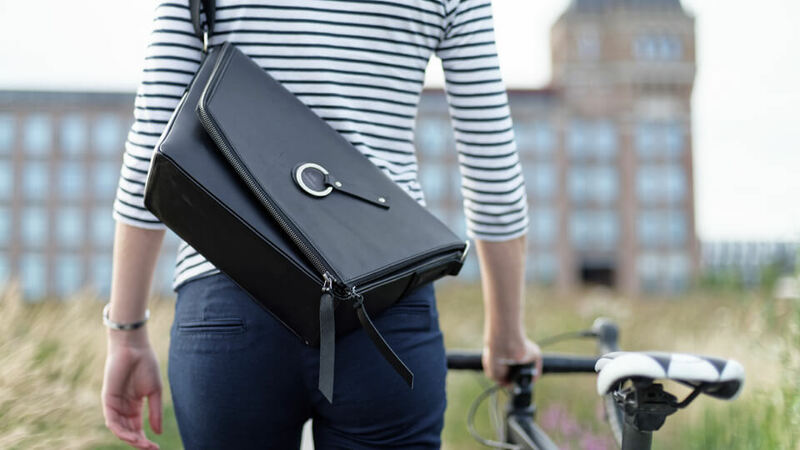 Because there are days when you’d like to carry even your house with you, the Messenger Bag has a Cargo mode, It can get bigger, so you can carry your laptop or a rainy cape. Mary Poppins would be jalous ! Use your bag in a normal position and carry your phone, wallet, keys, a small book, a tablet or a small bottle of water with a rainy cape. Use your bag with cargo position, unfolded, and add you A4 file or your 15″ laptop. 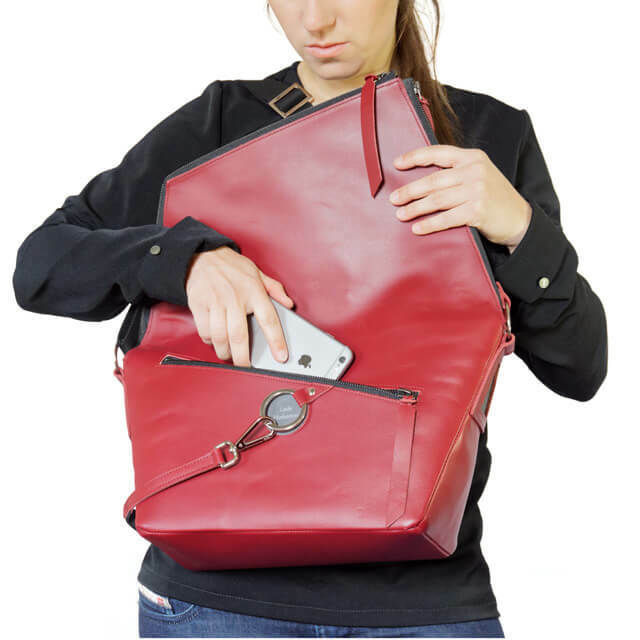 You can use the zipped pocket in front and access easily to your phone, keys or metro pass in two seconds. 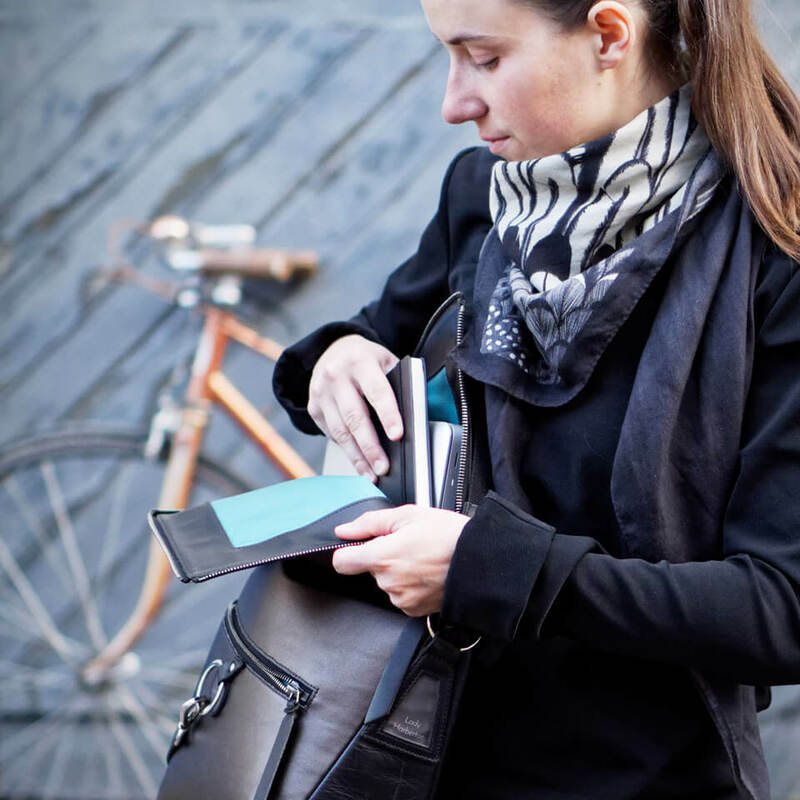 Your Messenger Bag is repellent to keep dried your belongings. The leather of the Messenger Bag is repellent. It means that under a small rain, the water will slide along the bag without coming in. You will be able to continu your urban journey without being worried about the rain ! Reflective, You are visible even at night ! The brand labels are situated on the face and side of the bag. They are reflective so you can be visible by the cars at night. You won’t keep unnoticed ! 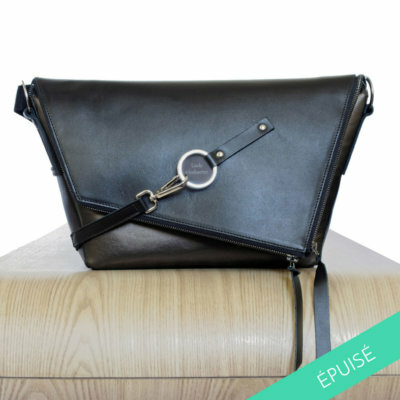 Because we want to keep the french leather knowledge and we choose the quality for our products, we chose to work with a french manufacture. 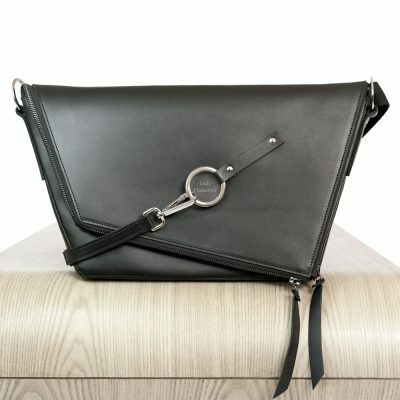 The leather Messenger Bag is manufactured in West of France by our production partner, labelled a Living Heritage Company, guaranteeing quality and expertise. Durable and resistant, your messenger bag is made with full-grain leather. 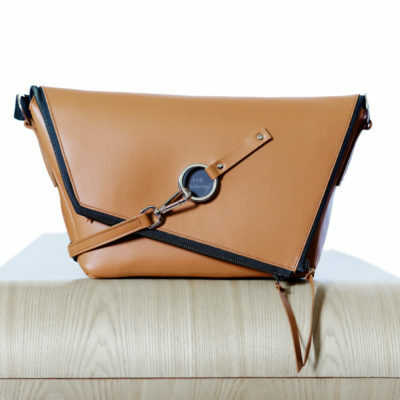 Le Messenger has been created using highly refined material, making it a thing of timeless beauty. The outer shell is made of full grain calfskin, guaranteeing both weight resistance and longevity.